So you might have heard that Nvidia released the GeForce GTX Titan X video card yesterday . It's the fastest single-GPU card on the planet (though not the fastest single card, because of the dual GPUs in the Titan Z and the Radeon R9 295X2 ). Maybe most people would be satisfied with the benchmarks of a single Titan X, but we're not most people. So we called a guy who knows a guy, and we acquired a second Titan X. The things we do for you people! UPDATE: We located a third Titan X, and we discovered that we need to upgrade our CPU! This is fun. It's an aging system, but it has plenty of juice to drive up to four GPUs. We used six titles to benchmark the Titan X and similar cards: Metro: Last Light, Hitman: Absolution, Tomb Raider, Batman: Arkham Origins, Unigine Heaven, and Middle-earth: Shadow of Mordor. We use these games because they have an even balance of Nvidia friendliness and AMD friendliness, they'll push your hardware when you max-out the settings, and they have built-in benchmarks, so you can reproduce our results yourself. 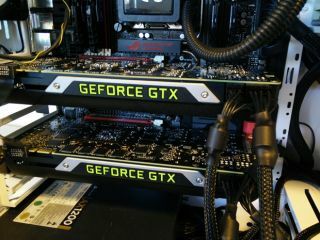 The Nvidia cards were benchmarked with the GeForce 347.84 sent to Titan X reviewers, which are apparently nearly identical to the 347.88 drivers released to the public yesterday. Our MSI Radeon R9 290X Lightning Edition card used AMD's Omega drivers released in December . The other cards in the mix are the Asus GTX970-DCMOC-4GD5; and the Asus STRIX-GTX780-OC-6GD5. The GTX 780 Ti in this roundup is the reference model. All clock speeds in the chart below are of the actual cards we tested, rather than the default clock speeds of the baseline models, except when a baseline model was actually used. Since we were not blessed with a second MSI GTX 980 Gaming 4G, the SLI benchmark is of two reference 980s in our possession. The difference will be small, but it is there. We're benchmarking these games on their highest presets with 4x multi-sample anti-aliasing (or in Tomb Raider's case, 2x super-sample anti-aliasing, since it has no MSAA option), so you're not going to see ideal performance here. We push these cards by design, rather than aiming for playable framerates. At the prices you're paying for these cards, you shouldn't have to make many compromises. Even with a second Titan X in the mix, though, we still can't hit 60fps across the board. Granted, at 4K, you probably don't need 4xMSAA, but it is interesting to see just how much this resolution affects performance. What's also interesting is how much the SLI scaling varies from game to game. The Titan X is a lot more constistent, but both it and the GTX 980 struggle with Metro: Last Light (which, it should be said, is an AMD-friendly game, as is Hitman: Absolution). When we add the third Titan-X (I think they're multiplying when we're not looking), we get a smaller performance bump, but this is to be expected. What we didn't see coming were the particularly modest gains in Batman and Shadow of Mordor, indicating that our CPU is hitting a wall (at least, at its stock clock speed). So this addition to our benchmarks has been educational for us as well. Metro: Last Light also didn't even recognize the third GPU, so we're considering dropping that game from our benchmark suite, because this is not the first time it's happened. And upgrading our testing rig to a 5960X is now a high priority. We'll also experiment with overclocking the 3960X that's currently installed. In the coming days, we plan to get you some more multi-GPU benches to compare against the Titan X. In the meantime, we hope you found these new numbers both delicious and nutritious.